What would a travel agency be without the craving to take the world by storm? We bring our boss to this section of the Magazine, Amuda Goueli, Destinia’s CEO and cofounder, to tell us about his latest travel adventure. Fasten your seatbelts because we are heading to…Uganda! The capital, Kampala, is 5,700 km from Madrid. The country borders South Sudan, Lake Victoria, Kenya, Tanzania, Rwanda, and the Democratic Republic of Congo (DRC). Although English is the official language since independence, there are over 40 languages spoken in the country, Luganda being the most widely spoken one. You’ll need a visa to enter the country –$50/about 45€– and, although there are no mandatory vaccines, vaccinating against yellow fever, and malaria, typhus and cholera prophylaxis is recommended. Date of the trip: Twelve days in July 2016. What were you searching for? To go back to my roots. As a boy, I used to wonder what laid beyond the waters of the Nile that bathed my village [Amuda was born in Nubia]. To get to see it was a personal challenge. I have fulfilled my dream. What is it that captivated you the most? Coming face-to-face with the gorillas. You end up speechless. As we were climbing up the mountain, we were all chatting. On the way down, we were silent. Seeing them makes you reflect a lot. The most uncomfortable part of the trip was… The lack of bathrooms! There are none, not even in the hotels. Some advice to get around the country more easily. First, relax and accept that things won’t turn out how you had planned. You have to adapt. Second, without a local guide, you can’t get around the country. There are barely any paved roads, most of them are just paths, and there aren’t many directions really. I used this agency. I recommend getting your permission to visit the gorillas at least three months in advance. There’s high demand. The price is about 600 euros. We landed at the new terminal of the Entebbe International Airport. There is a small abandoned building in front of it: It’s the famous airport where, 40 years ago, an airplane with Israeli hostages on board landed. Their rescue, the “Operation Entebbe,” took place at the time the Dictator Idi Amin was ruling the country. Our first destination is Fort Portal, very close to the border with the DRC. But I can’t begin the journey my mission is accomplished. To that end, we head to Jinja, the source of the Nile. It is curious to learn that 30% of it comes from a spring where the river meets Lake Victoria. Here I am, on the banks of the sacred lake, where the great Nile begins its 6,756 kilometre journey before dying in the Mediterranean. Here I am, where it all began: The source of civilizations, wars, and gods. I feel grateful for my childhood years in Nubia. The Nile’s waters gave me the best moments of my life, and I used to play on its banks with my friends. It was, and still is, the only source of water in my village. If you come to Uganda, you will have to walk. A lot. The setting of these lands, its forests, is spectacular. Differences aside, it reminds me of Switzerland at times. In the depths of the Kibale forest, we come across our closest cousins, the chimpanzees. Seeing them in their natural habitat is astonishing! They have a very sophisticated communication system (even a language), a structured social order, and are ferociously strong. We have heard about what the locals call “Man – Chimpanzee conflict zones,” where the two species have their own Planet-of-the-Apes-like a war between farmers and apes for control of an area of forest. On our way to the famous Queen Elizabeth National Park, we cross the line of the equator. It’s not the first time I’ve jumped between hemispheres, but it’s still a very special feeling. We travel on a highway that leads to the Congo and we stop in this very special place. There’s a sign that marks this spot, right next to a gigantic state poster against corruption, in one of the most corrupt countries in the world. It’s almost like a Greek comedy! The equator is a place of unique physical phenomena: A whirlpool will change from right to left depending on which side you are at, and by walking off-balance over the equator line, your body weight changes. I experienced it when I was in Quito, but it’s still fun to do it again. It’s like a children’s game, but for adults. We arrive at the gorilla highlands of Bwindi –it took us four hours to climb up. Exhausting!– in the midst of an impenetrable forest. 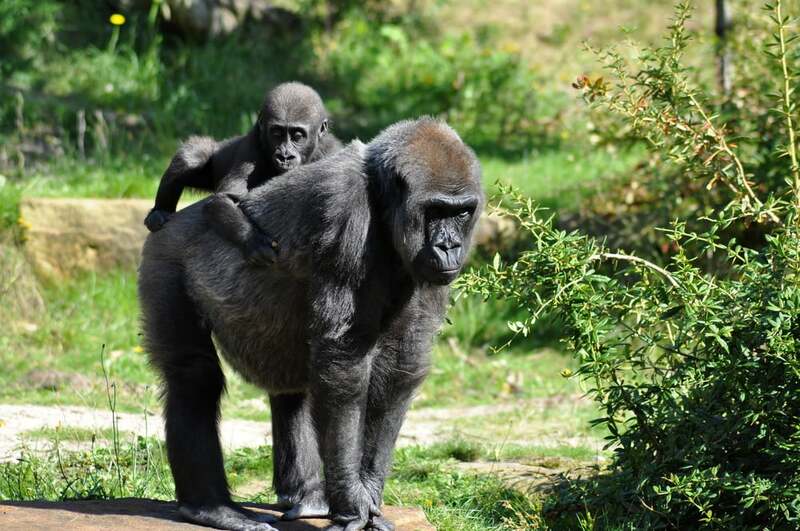 We knew there are only 880 wild gorillas left in the world, which typically roam the forests. Thanks to human beings’ pride and violence, they’ve been the subject of indiscriminate and savage hunts over the years, often to consume their meat or use them in witchcraft rites. When two groups of mountain gorillas meet, and you’re lucky enough to be on the scene, the two silverbacks –the alpha males– can fight even to death to protect their group or take on a location. And in that moment we’re advised to take a completely submissive attitude, making no visual contact, falling to our knees to avoid further enraging the male. There’s no other option because we’re at their mercy. 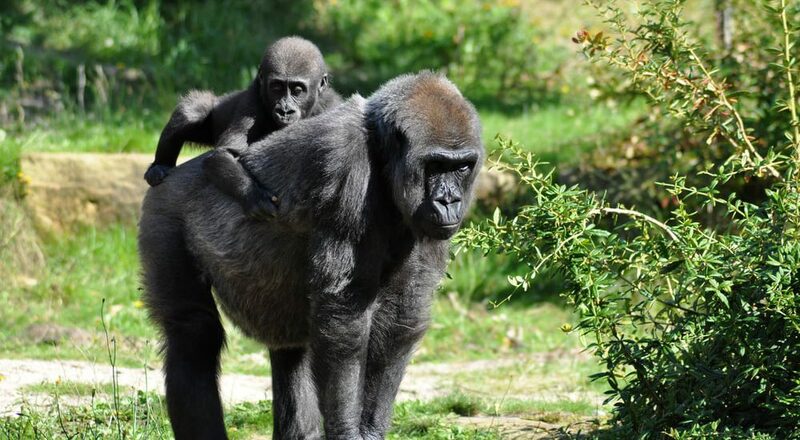 Although they’re strong and powerful, mountain gorillas are generally peaceful and shy, but their large size instils respect. May be the chimpanzee can be considered as more aggressive and dangerous. After being among them for more than an hour, I realized there’s not so much different between us and them: One is a naked monkey, and the other one is clothed. Lastly, a special mention to a tribe that has surprised me in a special way. From Bwindi we crossed Lake Puyonyi to visit the Batwas, a tribe of nomads who reside today at the top of a mountain where they relocated during the Rwandan Civil War. They live in isolation: only a certain missionary lives there with them and a foundation takes care of them. Here, the clock moves back in time. In their language, Batwas means “the short people” and I feel like a giant next to them. Hermes, I was browsing your website and noticed you have a broken link, it’s the IMAGES from instagram links. As an avid reader of blogdestinia, I love reading anything you write about, such as https://blogdestinia.com/en/the-best-hotel-breakfastsfrom-instagram, and anything you link out to. 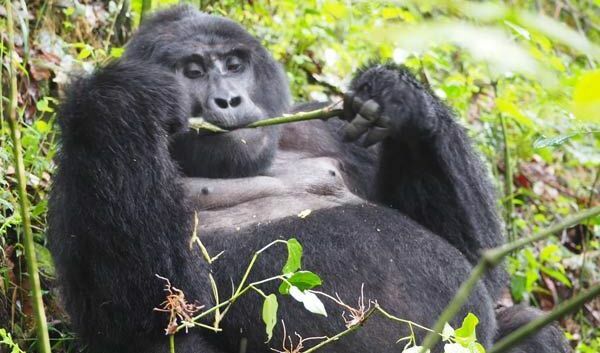 Sadly, I couldn’t see the images you were trying to link to, but I did happen to find another good webpage on the same topic: https://gorillaandadventuresafaris.com/sites/all/images/gorillanew.jpg and the article being https://gorillaandadventuresafaris.com/3-days-gorilla-trekking-bwindi. You should check it out, and if you like it, you probably want to switch the links. I know you are busy and probably get millions of emails a day, but I hope this one was helpful. I just wanted to help you out for once as Hermes has changed my life.